A wine glass in hand at 8:00 a.m.? Yes, I did it and oh did I love it. You see, earlier this week I shared a bottle of the beloved Arton Rosé with my gal Allison as we plotted our plan to conquer the world. Literally I couldn’t stop dreaming about the strawberry and raspberry yumminess of that wine even though I’ve had it several times before…… smooth, refreshing, and perfect for beating the summer heat……. Knowing it wouldn’t be quite so acceptable to pop a bottle the next morning for breakfast (or would it be??) 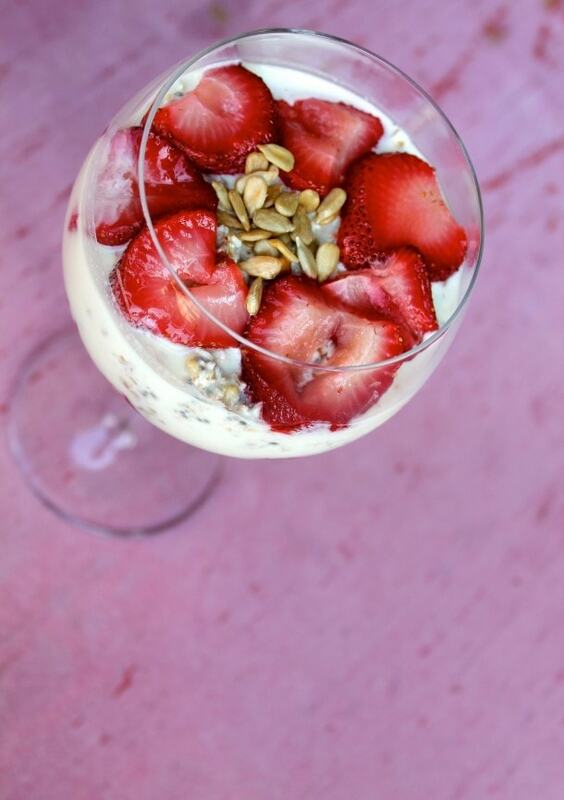 I decided to make something that was fresh, cool, and layered with berries – Roasted Strawberry Overnight Oats! Have you ever roasted berries?? The depth of flavor that bled out of these organic strawberries transformed them into candy. They burst with summer sweetness. 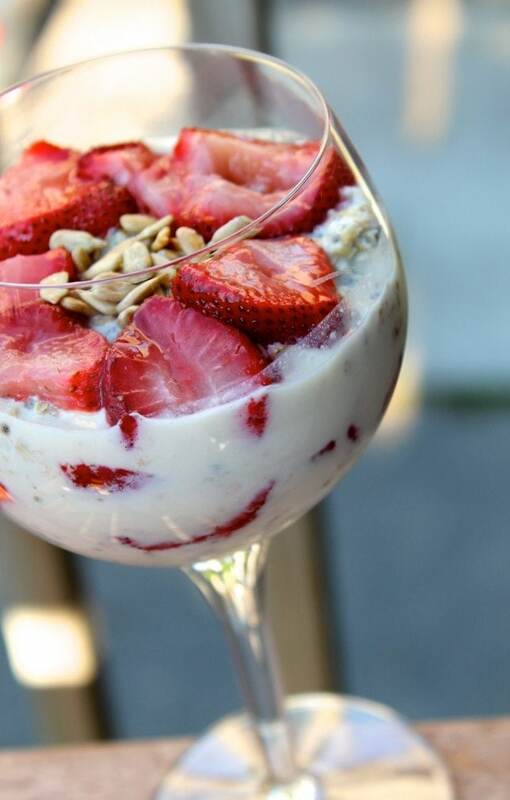 The great thing about overnight oats is they can be made the night before so all you have to do is pull them out of the fridge in the morning and enjoy a hearty, healthy breakfast. This version features rolled oats, a small amount of steel cut oats for added texture, and chia seeds. Chia seeds are packed with all the important things you need to get your day started having 2x the protein of any other seed or grain and 5x the calcium of milk! I roasted the strawberries the night before to make things super simple. Preheat oven to 400 degrees. Wash and slice strawberries, then pat with towel to dry. 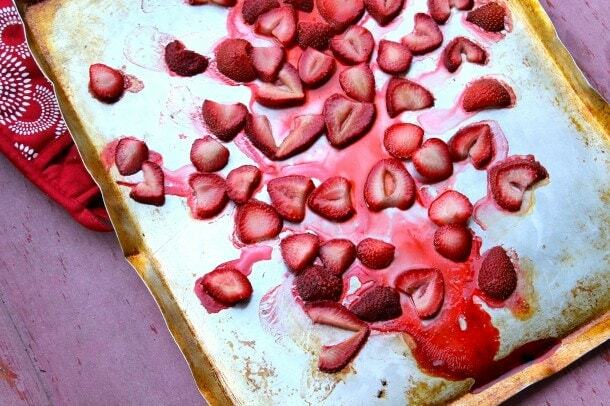 Slice strawberries (about 3 slices per strawberry) then toss in 1 bit of coconut oil. Spread out on a greased baking sheet and roast for about 20 minutes. Let cool and reserve. Combine all ingredients in glass jar or bowl, refrigerate overnight. In the morning, remove and layer with roasted strawberries and nuts/seeds (I used sunflower seeds). *I received these organic strawberries from Driscoll’s to celebrate berry season. My opinions and the recipe are my own . I was very happy with these berries and rely on companies like Driscoll’s to provide me with quality, organic produce in such a very seasonal climate like Minnesota. Even in the summer, the strawberries here usually last for about 3 weeks – way to short of a time! Strawberries are also on the dirty dozen list, with upwards of 10 pesticides used to get them to our grocery stores – yuck. I know eating organically isn’t always budget friendly, but sometimes your health is worth it! 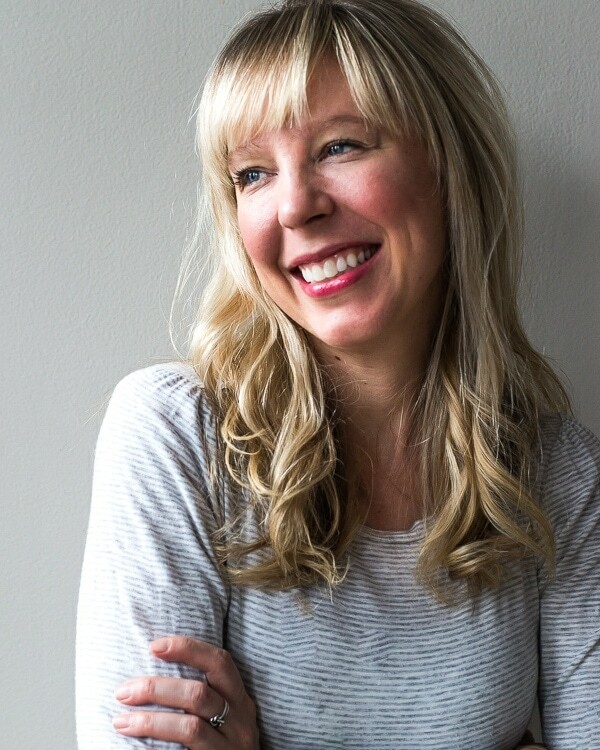 Amanda, I’m loving your photos. Everything looks insanely delicious. Way to go, lady!